Job for a Cowboy have wrapped up music and art on their fourth full length album, “Sun Eater.” Along with producer Jason Suecof, vocalist Jonny Davy, guitarists Al Glassman and Tony Sannicandro, bassist Nick Schendzielos, and session drummer Danny Walker have crafted a cerebral and accomplished piece of technical death metal. Job for a Cowboy wrapped up touring in 2013 as part of the Rockstar Energy Drink Mayhem Festival that summer. Following that performance, the band collectively decided to sharpen their focus and set an intent on cooking up a record that encompassed their full dynamic range of talent. The group had all agreed on the main course being a desire for futuristic tones, a wider spectrum of textures and tempos, and an emphasis on slightly more ancestral song construction. The result, “Sun Eater,” does not just sound like a new record, it sounds like an entirely new band. 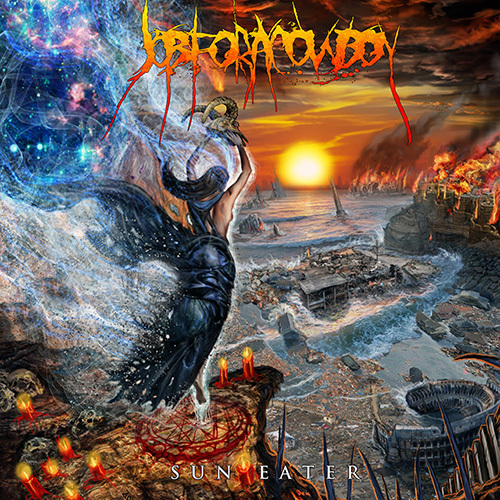 Listen to “Sun of Nihility” and pre-order the album now at metalblade.com/jobforacowboy.